And just like that, the holiday season is upon us! We love all social and food-centric occasions at TurningArt, but Thanksgiving has an especially infectious warmth to it that’s worth celebrating on its own. For many of us, it isn’t a warmth in the air (especially not for those of us in Boston) but even better, it’s a collective warmth of spirit that sparks in friends, family, coworkers, and strangers alike. When I began to think about what kind of pieces I’d like to feature for the holiday, it became quickly apparent that the go-to Thanksgiving-themed imagery falls into three distinct categories: food, Native Americans and Pilgrims, and festive cornucopias. Although they are technically relevant subjects, it’s a limited scope of the holiday by today’s standard. So, with that in mind, here are some TurningArt Thanksgiving picks that are decidedly not images of food, Pilgrims and Native Americans, or festive cornucopias. Enjoy! I absolutely love the choices Rine made in depicting this reunion. “How Have You Been?” is part of her Conversation series, which focuses on how small gestures and body language reveal people’s inner thoughts and perceptions. Rine cleverly titles each work in the series using snippets of familiar dialogue which, in tandem with her purposefully constrained vantage points and monochromatic backdrops, offer thoughtful and intimate insights into ubiquitous social interactions we experience so often around the holidays. 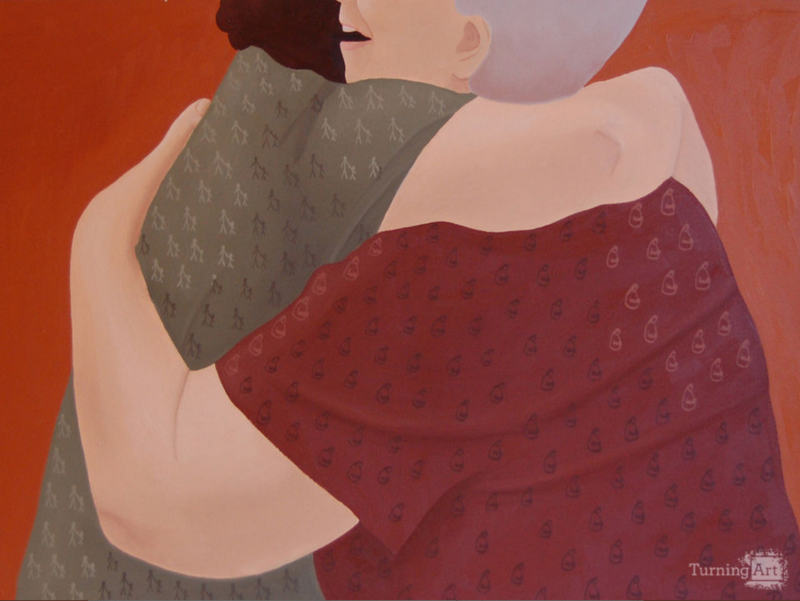 The warm autumn colors, big embrace, and excited exchange in “How Have You Been?” encapsulates the spirit of Thanksgiving at it’s very best. For a lot of people, watching the Macy’s Thanksgiving Day Parade is as ingrained in their Thanksgiving tradition as carving the turkey. Koyo Tamaki’s photo of the parade is captured from an unusual perspective that removes most of the context. 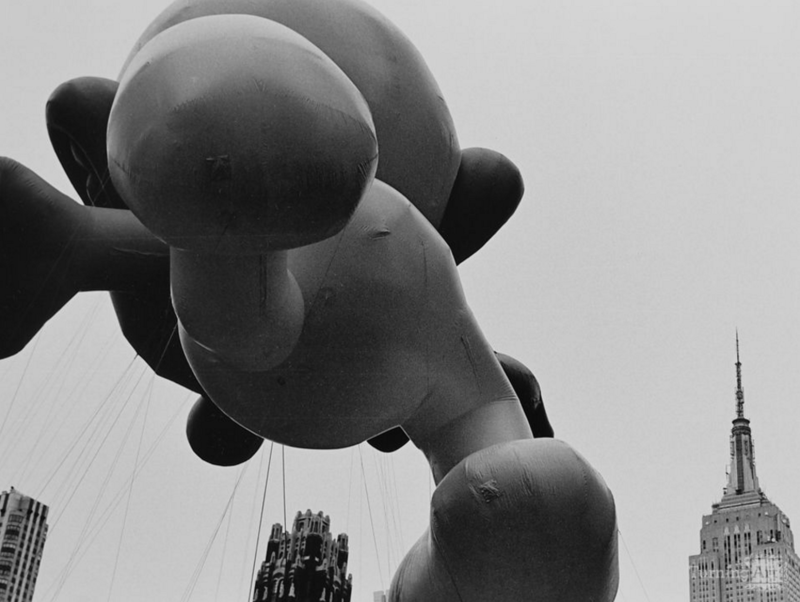 Instead of the cheery, bright balloon characters and crowded streets we see broadcasted on TV, this photo makes it look like the balloon is embarking on a Godzilla-esque tour of Manhattan. Koyo’s dark and slightly ominous take on a traditionally jolly holiday tradition conjures a playful and arresting dichotomy. 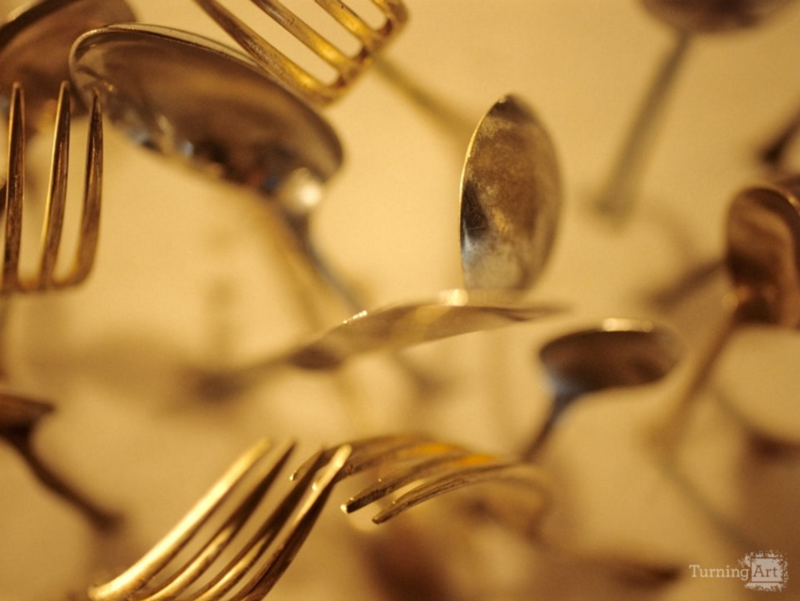 From now on, I think we should use Bruce’s title “Cutlery Vortex” as the term to describe the moment during a good meal when the food is served, the conversation stops, and the silverware clatters in action. The dancing silverware in this photo reminds me of an eager group rushing to the dinner table when the food is ready, or in the case of Thanksgiving, battling for second helpings. Nostalgia is a holiday guest that tends to show up invited or not. If it finds you with family or old friends, it’s always fun to indulge it by breaking out the home videos and some holiday film favorites. 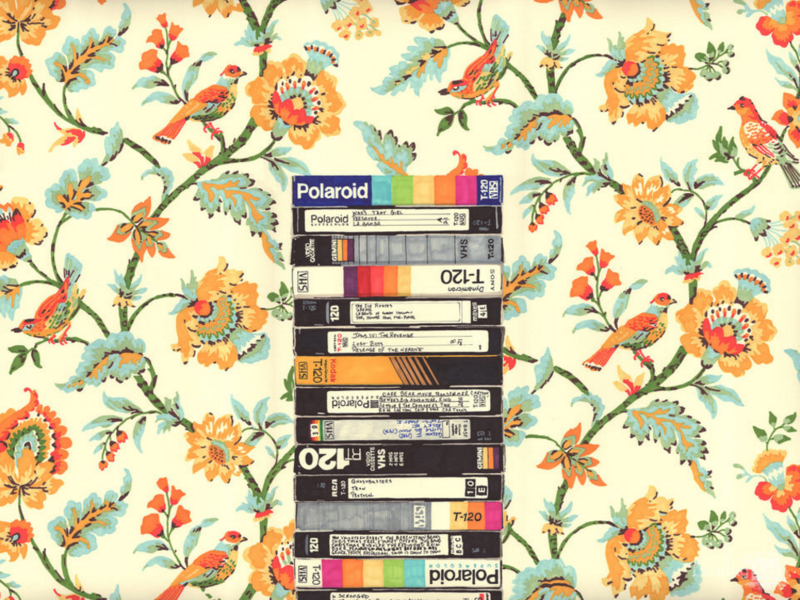 Hollis Brown Thornton’s marker drawing “VHS (Entry Hall Wallpaper)” explores a similar experience: the stacked VHS tapes are old titles from his family film collection, which he sets against the jacobean wallpaper pattern that was hung in his childhood house entry hall. Hollis explains that through his work, he erases, fragments, and simplifies objects to signify the ambiguous and limited nature of memory, as well as the constant notion of flux we experience in an increasingly digital world. 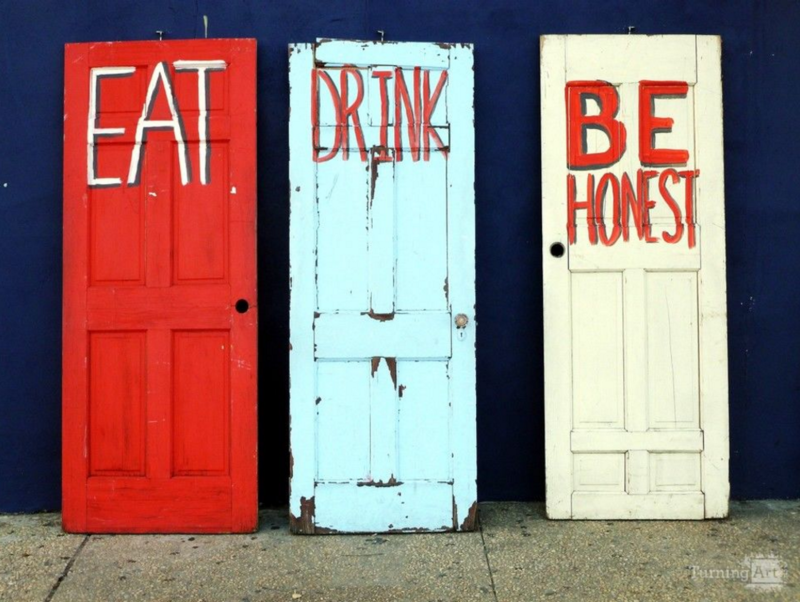 Dietrich’s photo of these three unhinged doors offers some impish and apt advice to take to dinner this Thursday. So, may we all kick the first door in, crack the middle one slowly (but surely), and for those of us spending the evening with a wonderfully mixed bag of relatives, step into the last one ever so carefully.